Cleanse and revive your skin with First Aid Beauty Caffeine Matcha Wake Up Face Wipes, a pack of pre-moistened towelettes infused with superfood Matcha Green Tea. 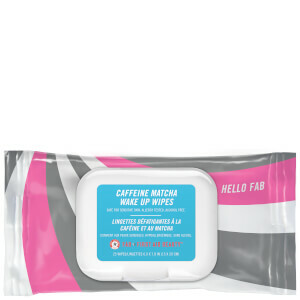 Hydrating and refreshing, the facial wipes effectively lift away dirt, oil and makeup whilst brightening, energising, moisturising and calming with a cocktail of Vitamin C, Caffeine, Hyaluronic Acid and Aloe Vera. Convenient for travelling and on-the-go, the wipes will cleanse and calm your skin whilst protecting against environmental aggressors. Free from oil, parabens, harsh chemicals and colourants. Wipe towelette over entire face and neck, avoiding the eye area. No need to rinse. Seal package tightly.